The Equitrekking team, including host and equestrian Darley Newman, recently traveled to Botswana, Africa to ride in the Okavango and had an amazing experience on this horse safari, which we filmed for the Equitrekking TV show on PBS! Established in 1995, Botswana Okavango Delta Safari is your ultimate horse safari vacation. From riding as part of a herd cantering across the plains to watching the setting sun while listening to the calls of lion and hyena, this is an amazing African horseback safari! The main attraction of horseback safaris is the joy of riding good horses over superb natural country, with just about every landscape dotted with game. The riding is varied, sometimes quietly walking, stalking big game and admiring the bird life, sometimes cantering through the water-meadows alongside galloping giraffe. Macatoo Camp is situated in a 500,000 acre private concession in the Delta. The Okavango is the largest inland delta in the world, a mix of labyrinth channels, palm fringed islands and fertile floodplains. Trapped in the parched sands of the Kalahari desert, it is a magnet for the wildlife who depend on the delta's life giving waters. More than 400 species of resident and migrant birds, lions, elephant, hyenas, wild dog, buffalo, hippo and crocodiles congregate with a variety of antelope and smaller animals - warthog, mongoose, genets, monkeys and bush babies to name a few. There are a variety of horses at the camp that are trained to meet your needs and used to the Delta's unique terrain. Qualified guides will share with you their intimate knowledge of this wilderness, using the horses to best effect to bring you closer to birds, game and nature. Non- riding spouses, partners, friends, and children are welcome on the Okavango Horse Safari and can enjoy the many alternative activities offered in the Okavango Delta including game drives, seasonal boating, mokoro and fishing. The weather, game and waters change throughout the year in the Delta. March/ April: Warm or hot during daytimes and pleasant at night with some rain. Because of the rain and waterholes, game is dispersed throughout the country - so not concentrated in herds yet. Possible still to see the plains game: zebra, wildebeest, impala etc as well as elephant, maybe buffalo and cats. Pools left over from rainy season, but floodwater unlikely within distance of the camp. May: It's cooler at night, but still pleasantly warm during the day. Rain unlikely. The Okavango annual floodwaters normally arrive in May or June - so are within riding distance for a couple of weeks before they actually reach camp. When the water arrives initially the birdlife is great as they feed off the shallow water areas. Game comes to drink from the water, with the buffalo and lechwe moving in as the water levels increase. However, there is a lot of water - so much of the game is still dispersed. June/ July/ August: Botswana's winter, which can be chilly / cold in the early morning and evenings - warm in the middle of the day. This is when the water is at its highest levels, so there's plenty around to ride through and go boating on either in the motor boat or mokoro (canoe). Large herds of lechwe forming in the wetlands and perhaps hippo and crocodile in the area. Good potential for buffalo sightings with impala, tsessebe, kudu etc moving inland on islands. September/ October: Winter is over and it gets progressively hotter building up to the first rains, which clear the hazy days and the skies are big and beautiful. Trees come into flower and then leaves go green and fruits grow. Evenings are warm and the plunge pool gets a lot of use! The floodwater normally stays around the camp area until October - but this, of course, depends on how big the flood was to start with. The game now tends to concentrate as the water sources lessen - often big herds of buffalo, elephant and with shorter grass more plains game can be seen. More likely to see wild dog as well as the cats who favour dry savannah such as cheetah. Young giraffe and lechwe; hyenas more evident cooling off in the pools. November- February: The rainy season is any time from November - but impossible to say exactly when and how much. Normally the rain comes for an hour or so every day and then often goes away for a week or more before it rains again. It is warm to sticky hot before the rain and cooler after each rain. Depending on the flood level, there will be some water around with the rain topping up the pools. Very good until the first rain when it disperses again - the young antelope are born at this time and are very entertaining to watch. 2010 & 2009 Good Safari Guide winner of Best Horseriding Safari in Africa! 2011 This safari was filmed for a future episode of the Emmy-winning PBS TV show, Equitrekking. Host Darley Newman and her crew had many adventures riding with elephants and wildebeest, fishing, canoeing, taking game drives and eating out under the stars. What level of riding to I need to participate in this Botswana horse safari? Expect to spend 4 to 6 hours a day in the saddle. You will need to feel confident in keeping up with the group, capable of riding at all paces, rising to the trot and controlling your horse at the canter. You may be required to gallop out of trouble, so no beginners for this trip. Please let Equitrekking Travel's preferred travel agent know your packing questions prior to the trip. Check out general informaiton on packing for riding vacations and see what we took on our Africa riding holidays. Below are recommended items to pack for this horseback safari. Jersey, fleece or multi- pocketed waistcoat. Light weight waterproof windbreaker jacket. Sun block, lip balm, insect repellent. Please note that insurance companies may only cover you if you wear a properly fitted recognized riding helmet. There are not helmets for you to borrow at the riding safari camp, so please bring your own. There is complimentary laundry service, although for hygiene reasons the camp does not wash underwear. Washing powder will be provided in your room for this purpose. Towels and amenities are provided. All clothing should be neutral colored to blend in with the bush (Preferably shades of khaki, brown, beige or green) Light weight cottons are advisable. Please take into consideration when you are coming as the weather does vary. We recommend that you wear your riding clothes and boots on the plane and bring your hat and wash bag as hand luggage as luggage sometimes gets delayed. Luggage is limited to 20kgs (around 40 lbs.) per person, including hand luggage, in soft bags on the light aircraft into the Delta. Extra luggage can be stored in the Maun office. Horses include a variety of Thoroughbreds, Namibian Hanovarians, Arabs and Kalahari-Arabs crosses, ranging from 14 - 16.2 hands (140-165cm). There is a choice of English and Western style trail saddles, each with their own water bottle. There are over 40 horses and the riding style is varied but mostly English. The horses are loved and well cared for by stable manager, who has been with the company for over 10 years. Mod's gentleness with the horses, together with his friendly nature and warm smile ensures that horse and riders are perfectly matched. Whether you are travelling alone, as a couple or as part of a larger group, your time spent around the camp fire, drinking sundowners on the deck, or dining al fresco will mean you are sure to acquire new friends during your stay at Macatoo on your African horseback safari. The Botswana Okavango Delta Safari enables its guests to experience the joy of riding good horses over superb country, with just about every landscape dotted with game. The Okavango horse safari team is inspired each day by the beautiful surroundings to provide the best safari experience possible for the guests, while being enormously privileged to have a huge unspoilt wilderness in which to run these safaris. The Okavango Delta is an intriguing phenomenon, with ever changing landscapes due to the seasonal flood waters coming through from Angola. The movement of the game, the dramatic seasonal changes in the flora and the varying interests of the guests ensure that no two safaris are the same, each one is unique. Prior to your early morning ride you will be woken just before dawn by a tent lady bearing gifts of tea or coffee. There will be time for a slice of home made toast or a bowl of fruit before you set off. On your return, late in the morning, you may wish to have a quick shower before indulging in Lydia's mouth-watering array of lunchtime fare. A siesta now beckons, whilst the sun is at its strongest, but sunbathing by the plunge pool, a good book, sorting through your photos or watching the wildlife on the plains in front of the camp are popular alternatives. Tea is served prior to your evening ride or drive, and on your return there is time for a sun downer and shower before dinner is announced. The menu is varied and excellent, accompanied by attentive staff and a good selection of South African wines. Much time is spent re-living the events of the day, with the occasional myth creeping in too! The 4x4s are used for night drives, spotting the nocturnal species and for close up photography of kills and predators. When the water levels permit, a boat trip allows for another perspective on the game. More than 400 species of resident and migrant birds, lions, elephant, hyenas, wild dog, buffalo, hippo and crocodiles congregate with a variety of antelope and smaller animals - warthog, mongoose, genets, monkeys and bush babies to name a few. You may also spot the Lechwe. The Lechwe, or Southern Lechwe, (Kobus leche) is an antelope found in Botswana, Zambia, south-eastern Democratic Republic of the Congo, north-eastern Namibia, and eastern Angola, especially in the Okavango Delta, Kafue Flats and Bangweulu Swamps. The camp features comfortable twin/double meru tents with en-suite facilities, hot water showers, comfortable beds, desks, wardrobe and luggage stand as well as a private deck overlooking the floodplains. All tents are supplied with drinking water, towels, soap, shampoo, conditioner, body lotion and insect repellent. All tents are equipped with solar lights but please note that there are no power points in the tents. A central power point is available in mess tent area for charging of camera’s. Laundry service is provided. Centrally there is a large furnished mess tent and tucked away a private pool. On the longer safaris, guests have the opportunity to experience the thrill of riding out to a mobile fly-camp. Meals consist of morning tea and biscuits in bed to a light breakfast - cereals, yogurts, fresh fruits and toast. Snacks on the ride include flapjacks, fruits and peanuts and raisins. A hearty lunch is served and generally made up of at least one warm dish (ie pie, quiche, pasta) two salads, freshly baked bread and followed by a cheese or fruit platter. There is sometimes an afternoon tea and cake to be followed by a multi-course dinner. An ideal traveler is an advanced rider who wants to experience the holiday of a lifetime on a horseback riding safari in Africa, time and time again, as most of guests end up returning! You will spend 4 to 6 hours a day in the saddle with groups of up to 8 guests. You will need to feel confident keeping up with a group and be capable of riding at all paces. You may be required to gallop out of trouble, so beginners are not allowed. Flexible departure dates are available, so please contact us for availability. Non Riding Rates- 50% discount offered for non-riding children (under 12 years old) and 10% discount offered for non-riding adults joining a safari. Non-riding activities include game drives, boating, mokoro excursions and fishing (all activities are subject to water levels). There is no single supplement if you are prepared to share, otherwise there is 50% of the ride price to guarantee a single tent. There is one tent which can be allocated to a single person without payment of a supplement - this tent will be strictly allocated on a first-come, first-served basis. Once this tent has been allocated the supplement will be payable to guarantee a single tent. There are no set departure dates so you are welcome to choose the dates that would best suit your itinerary. There is a minimum stay policy of 3 nights but recommend 5-10 nights or longer. Accommodation, all meals and local beverages, riding and non-riding activities and 12% Government VAT. Visas and full travel and medical insurance - which is essential, Return transport from your home to Maun/Kasane, Charter flight from Maun/Kasane to camp (see rates below), Gratuities for camp staff and guides, Purchases from the gift shop. 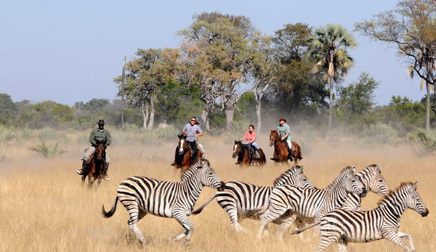 Below is a sample Itinerary for a 7 night riding safari. Itineraries are dependent on the season and levels of the Okavango flood. Boat and mokoro trips are only available when the area is flooded. Local weather conditions may also affect game movements. of elephant look from the air. A safari vehicle will be waiting for you at the camp’s airstrip for the 45-minute game drive – or an exciting boat ride (depending on the time of year) - into Macatoo Camp where staff will greet you with a welcome drink. After settling into your tent, you will be offered afternoon tea and homemade cake during a briefing from your guide before heading to the barn for a ride. The pace of the evening rides are deliberately slower giving you the time to enjoy the sunsets and make the most of the photo opportunities offered by the birdlife and game. After a hot shower and change, drinks and snacks are served in the comfortable mess tent ahead of a candle- lit dinner by the fire. keeping up with some of the large moving animals, such as giraffe or zebra. African Fish Eagles steal your catch from right under your nose. A game drive, accompanied walk or boat rides – depending on the time of year – are also available for those wanting time away from the horses or for non-riding partners and guests. Day Four: We ride through different country, making our way through clouds of bushman hair grass to plains dotted with fig trees. We might encounter giraffe or shyer antelope while passing through mophane woodlands. Our pace increases as we break out onto the flood plains, often disturbing troops of baboons. Return to the camp for an afternoon spent at leisure, or the possibility of hiring a helicopter for an hour to gain access to remote and otherwise totally inaccessible parts of the delta with spectacular photographic results. Finish off the day with a night drive by spotlight, where the resident clan of hyena are often spotted. Bushbabies leap from branch to branch through the terminalia and acacia trees – only seen by the brights of their eyes. If lucky, the spotlight will pick up the glint of a leopard’s sultry stare. If we find lion on the drive or know where they are – perhaps we might have seen them earlier from horseback (and avoided them!) – we can spend quite some time watching them from the safety and comfort of the vehicle, over snacks and drinks, as they wake up from their long afternoon rest, groom each other, and prepare for a night of hunting. It is always such a highlight of the holiday to see a big cat – we will have lots to talk about around the dinner table that night. Day Five: This morning we ride deeper into the heart of the delta, to corners of the wilderness where vehicles simply cannot reach – horses can get much closer to the big game. We cross high palm islands which offer great sweeping views of the Delta plains – are those anthills or giraffes in the distance? Riders may have joined non-riding friends and family for a walk, drive or boat ride – but all guests will reunite for an unexpected champagne breakfast under a large baobab tree to swap ‘survivor’ stories from the morning. By now, you will have settled into the wonderful rhythm of camp where great adventure, creature comforts and downtime are combined to provide a break. After tea and a gentle sunset ride, you may find yourself at our fabulous tree house where you will have the option to spend the night out, sleeping high up in the tree canopy under the African night sky. From there, it is fascinating to watch and listen as the birds and animals prepare for night – by roosting, travelling or preparing to hunt. The barking of baboons and calling lions provide an unforgettable soundtrack to a night out under the stars. Your guides will stay too, providing great company and peace of mind – for many guests, this is a real highlight of a holiday to Macatoo. eyes. After last night’s treetop sleepover, – a prompt bedtime will most likely to be the most popular after dinner activity, as we save our energy for the last full day and night. Day Seven: Don’t forget your pocket camera today, but store it carefully because things could get rather wet! We will explore the shallow and deeper flood plains; they look so pretty, scattered with flowering lilies. The reflection of the trees – and your horse – will provide great images to capture. Many of our horses love to eat the lilies as they wade – sometimes swim – through the water. Here, the Cape buffalo can gather in large numbers (anything between a dozen and 2000 at a time). We have to creep up on them using the islands as cover. You will be keen to review your pictures after lunch, but don’t forget to re-charge your cameras in the mess tent! The evening offers the choice of a game drive, fishing or a last quiet evening ride with the by-now familiar smell of wild sage and the warm African dust as the sun goes down, transforming the skyline into a cocktail of oranges and reds. Dinner will be a memorable one perhaps with another surprise location in store.....! Day Eight: The dawn call of the African Fish Eagle has, by now, become as familiar as the morning alarm at home. The delivery of tea or coffee in bed heralds the start of your last morning in camp and you will be anxious to make the most of your final ride. We stay quite close to home, splashing through water on the vast open plains, home to blue wildebeest and Burchell's zebra. The riding pace will be deliberately quite fast as we cram as much fun as possible into the final hours – be prepared to get wet as we approach deep reedy areas full of bird life including open-billed storks, squacco herons, slaty egrets and egyptian geese. You will return to Macatoo along the myriad of waterways lined with large trees, before arriving back at the barn where you say a sad farewell to your horse. There will be just enough time to shower, change and pack before the game drive to the airstrip, carrying a picnic lunch to tide you over until your return to the real world. Don’t worry, you can always come back – so many of our guests do! ** This itinerary is a sample itinerary to serve as a guide. Itineraries are subject to changes due to the weather, the trip guide's discretion and other factors. Please note this Horseback Safari is exciting but not strenuous. All scenarios are dependent on the season and levels of the Okavango flood. During cooler months one longer ride may replace the normal morning and evening rides. Local weather conditions may also affect game movements. Also note that depending on individual itineraries some guest might miss their ride on the day of departure or arrival specifically when flying to/from Kasane. It is hard to know where to start and what to say because when you have had the best holiday of 62 years there is so much to think of and be grateful for. In every sense of the word it was truly memorable. From the moment we touched down at Cement airstrip until we left you at Maun we were made to feel that we were the only thing that mattered. All your staff, without exception were first class hosts. None of us have ever spent a ten day period during which we laughed so much. Please pass on our deep felt and sincere thanks to each and every one of them for the parts they all played. Once again please tell all especially Kim, Bongwe, Douglas, Sekongo, Mod, Mary, Matthew and James how much we appreciated the time we spent with them. We preciously keep in mind every moment and every people, every canter and every dinner... Every glass and every discussion. This was so far, a moment of its kind that makes your life different after it. Accept our most sincere gratitude and extend it to your staff: Life is better after you! I appreciated not only the professionalism but also the kindness of the whole team. The horses are brave, the environment is pleasant, the rhythm of the day perfect and the food and wine very good. A very special thank you to Sekongo and Scorpion who both demonstrated their experience either in the front and at the back of the riders!! All the best to all of you Paola. Safaris for riders and their non-riding companions available. 12 years and over. Experienced riders only. Year-Round, depending on what suits you best.